Taste test: These were not my favorite taste in a chip. 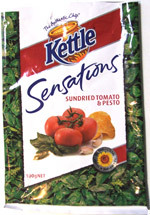 I found the powder tomato flavor a little off-putting, but I was willing to give it a go as Kettle's other "Sensations" flavor combinations have worked so well. While these were nice enough, with a strongish tomato and pesto flavor, I just wasn't won over. Smell test: Tomato and a slight basil smell.